Asbestos exposure can cause a number of deadly diseases and they can take a long time to develop—up to 40 years. Asbestos-related diseases are the #1 cause of work-related death for people who have worked in Ontario construction. If you work in the building trades, then you have probably been exposed to asbestos. Workers entering Type 1, Type 2, or Type 3 work areas to perform work not related to the asbestos operation. We offer two asbestos abatement certification programs: one for workers and one for supervisors, as well as an instructor workshop. 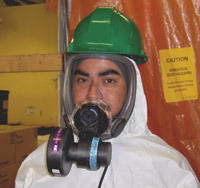 Before becoming a certified asbestos abatement supervisor you must be certified as an asbestos abatement worker. air clearance sampling, cleaning and testing. You can access the online version of the asbestos regulation or download the print version below. As well, there is a link to the Ministry of Labour (MOL) website which contains a guide to the asbestos regulation. The Asbestos Chart helps you determine the "Type" of your asbestos operation as well as the respirator you require. It is intended to be used in conjunction with IHSA's data sheet Asbestos: Controls for Construction, Renovation, Demolition (DS037). The Asbestos Interactive Tool is an excel file that you can run online or download to your computer. The tool presents you with a list of asbestos removal operations. Just click on the option that applies to the type of asbestos removal you will be performing and the tool will determine the type of respirator required to do the job safely. Asbestos-related diseases are the #1 work-related cause of death among Ontario construction workers. In this presentation, find out what asbestos is, what the potential health effects of exposure can be, how to identify asbestos in infrastructure, and how to work with it safely.